The musical evenings of Chennai, in its peak of the Marghazhi season, musing rasikas making a bee line to listen to their choice musicians and choicest sabhas, continued discussions on music, taking notes and exchanging experiences…all these denote a healthy trend in the preservation and growth of carnatic music and its always a pleasure and prestige for every musician to perform in such a kind of a highly interactive podium. 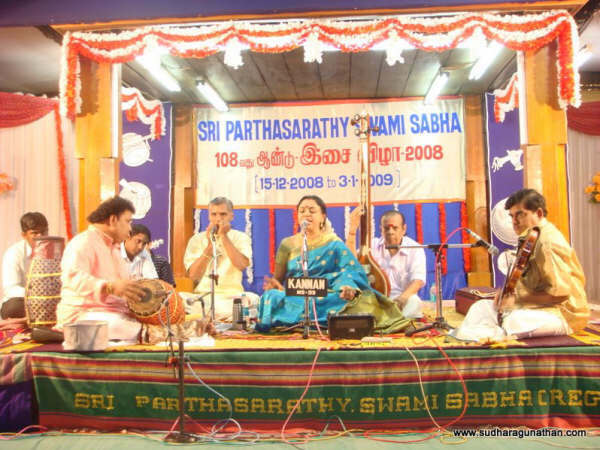 Sudha’s concert on 6 January, 2009 carried the same spirit. It was her 15th concert for the season and mood was expectant and watchful. The concert began with a varnam in Adi thalam and raagam Ranjani. It was a composition of Sudha’s grand guru Shri. G.N.Balasubramaniam. Then followed a shloka, Shri Raghavam. This was pursued by ‘Jaya Jaya’ of Purandara Vittala, in raagam Naattai and thalam Kanda Chaapu. The swaras flowed to a smooth crescendo and simply lingered. While the medley of raagas reigned, Sudha embarked on Muthiah Bhagavatar’s kriti ‘Sudhamayee’ in Amruthavarshini. The neraval and swaras were handled with ease, with the twists and turns creating a gentle cascading, flowing into the minds of the rasikas, in all fervor and devotion. Sudha was ably supported by Shri Raghavendra Rao on the violin, Shri Patri Satish Kumar on the mridangam and Shri Raman on the moharsing. Just after Shri Raghavendra Rao’s final stroke on the violin, ending the musical treat of Amruthavarshini, Sudha communicated to the audience. She extolled on the raaga named Amruthavarshini which on being sung with the right chord, was known to bring in rains. She mentioned her experiences of the torrential rains post her performances at Denmark, Doha and Delhi and the rains descending out of season! One pauses here to wonder whether such things do happen in the days of Kaliyuga, where less and less is attributed to works of the Divine, and more and more to science and technology or other derived instances. As though to put all thoughts and doubts to rest, Sudha continues… ‘I don’t know if it is going to rain on my singing but I am sure it will rain ‘happiness’ for all of us in 2009′! This was followed up with an RTP in Thodi which was concise but truly held the essence in good measure. Raagamalika swaras in Khamboji, Simhendra Madhyamam, Kaanada and Naatai Kurinji simply gripped the audience. It was indeed an enjoyable evening and one could see the entire ensemble giving their best. Great team work indeed! Post the central pieces, there were the rasikas’ requests – the all pervading ‘Kurai onrum illai’, the lively folk number ‘Vallikanavan’, and the bhakti soaked Ugaboga, followed by the evergreen ‘Baro Krishnayya’. The thillana in Brindavani gave a fitting finale to the magical evening. There was an interlude, requested for by Mrs. YGP, where she showered encomiums on Sudha. She christened her as the ‘uncrowned queen of carnatic music’ and lauded her for the consistency and purity in her renditions and that she has held centre stage for so many decades now, purely with her commitment and dedication. She said that it was ‘thein mazhai’ throughout. That apart, there was also an adventurous streak in her for the daredevil attempts to shoot on the rocks amidst the waterfalls for the Pothys advertisement. Thanking her for her generosity, Sudha reciprocated saying that it was an honor to sing for the institution of Bharat Kalachar. Well, the connect between the rasika and the musician did not end there that evening. Looks like the Gods from above wanted the relationship to continue as they had been invoked by the powerful Amruthavarshini in all its pristine and sincere rendering. Chennai saw rains that night, it continued the following morning and the skies are still overcast as this write up goes for upload. Is it the power of music, is it the devotion, earnestness and fervor of Sudha’s rendering, on being sung with the right chord, is it a fortunate coincidence that it showered in an untimely phase, or is it just that there were collective prayers..? Whatever it may be, for lovers of music, for connoisseurs of pristine renditions, for the devoted and sincere musician, it is just that powerful moment of truth…that deeds done in earnestness are noted by the Almighty and get their due….Sudha’s full throated rendition of Amruthavarshini did bring down the rains, which has left both the rasikas and Sudha herself so overwhelmed making it a memorable evening, etched in the sands of time, to stay in the minds and hearts of the gathering that had the privilege of being a part of the evening! No wonder it is stated that music takes you closer to the Gods….! Ini neengal ungal kutcherikalil Amruthavarshini paadum bodhu Demark, Dohavil mazhai peydhadhai solvadhudam netraya Chennai kutcheriyaiyum sollanum. It’s my humble request. Hi! Gowri here. Rain has come. The power of raga Amruthavarshini is proved beyond doubt in your vocals. Well, yesterday’s performance left us spellbound. Your voice was in great control throughout, subtle, swirl, swing and all the acrobatics came out in full strength. The main positive attribute to the concert is the formatting of songs and its sequence. The RTP is par excellence…. Good morning Mam. “God’s angel sings and Nature pours”. Thank you for the rain of happiness around and strengthening my faith J. You are not only the ‘uncrowned queen’ of carnatic hearts, also lots of happy hearts! Hi heard you brought rain in Chennai with your Amruthavarshini – read it on the net. That’s because you were so sincere and God showers his blessings on you. I got goose pimples when I read this. Your concert at YGP auditorium was splendid and I find no words to express it, such a remarkable performance. Amruthavarshini which you sang has brought in rains as stated by you. It has rained on Tuesday night, yesterday and now the forecast is, a depression has been formed and more rains expected. Hat’s off to you mam.